I saw a tip posted on Rena Klingenberg's great tips newsletter and website - http://www.home-jewelry-business-success-tips.com - and sent in by Beth Millner. I felt sure I could adapt it to hang and display my various semi-precious stone rosary beads. 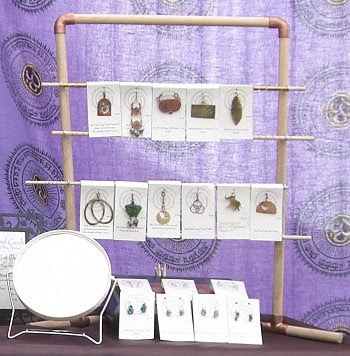 Beth had made hers from a combination of wooden dowelling and curved and t-connectors for copper piping and was using it to hang cards for her pendants. The incredible thing was that when I went shopping in Woodies, dowelling was actually 50% more expensive than copper piping (!!) as well as being a shorter length, so I was delighted to be able to treat myself to a long length of half-inch copper piping and make a really good-looking stand which I have protected from tarnish with a light coating of Renaissance wax. The hardware shop was also my source for the clear shower curtain rings I used to hang the beads on; very convenient as they can be opened individually to remove a rosary to show clients. The beauty of this design is that it can be made to almost any height and width you might require. It did a great job for me!! I can see myself making more of them! Great job on the copper displays! 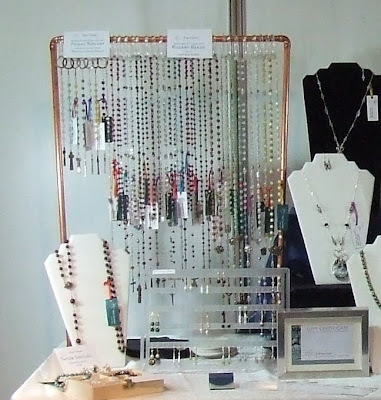 I love the rosary bead stand! Great idea! I can't believe that is four years ago!